"Chamsa": Ward against the evil eye. In Judaism, there is a concept that people have the power, just by looking at others with evil thoughts, of somehow causing something negative to happen. 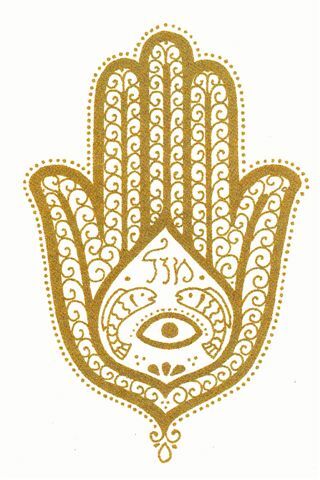 The “chamsa” (upraised palm symbol) is popular in Sepharadi culture as a ward against the “evil eye.” The Kli Yakar explains that there is something more effective. The Kli Yakar quotes the Talmud (Tractate Bava Batra 66a) that part of the blessing was based on the fact that no tent opening looked onto the opening of its neighbor. The Children of Israel practiced a noteworthy modesty, not seeking to cast an eye upon the goings-on of other households. Bilaam realized that if the Children of Israel had already taken proper precautions against the evil eye internally, then he would have no chance to cast an evil eye himself. The Kli Yakar adds that the merit of the “tents” protected Israel from the evil eye. The tents are a synonym for none other than study of the Torah, of Jewish law and tradition, which protected and continues to protect the Children of Israel from the evil eye. May we never have an “evil eye” cast upon us, or at least protect ourselves with study and modesty.